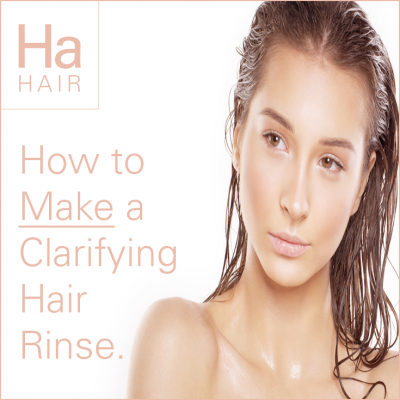 How to Make a Clarifying Hair Rinse. You’ve heard the buzz that certain chemicals, sulfates and parabens, found in commercial beauty brands can cause cancer and disrupt hormones. While these statements have not been scientifically proven, it’s better to be safe and not sorry. Making your own beauty products at home may seem daunting, but is actually one of the most empowering ways to take your beauty and potential health back into your own hands. Fact: All of those coveted hair products you use daily can leave a build-up of residue on your gorgeous locks, which can make your hair appear lifeless and dull. Solution. Use a clarifying rinse once to twice a month to remove any left-over residue from your strands. HOW TO MAKE YOUR OWN CLARIFYING RINSE THAT IS ALL-NATURAL AND TOXIN FREE. This homemade beauty treatment will remove residue and leave behind a healthy shine, and may even help with dandruff. This pantry staple is packed with essential nutrients like B vitamins, vitamin C and potassium, which are great for restoring lusciousness to your locks. The acidity of apple cider vinegar when diluted with water helps to restore natural pH balance to hair strands by hardening the outer layer and flattening the cuticle resulting in smooth hair that shines. For those who suffer with dandruff or a flaky scalp, this clarifying hair rinse could be the answer to your prayers. Apple cider vinegar contains a natural alpha-hydroxy acid, which gently exfoliates the scalp, removes dead skin cells and built-up residue on the hair – making it easier to style. Step 1. Combine all ingredients in a spouted cup for easy application and stir. Step 2. After shampooing, pour the rinse over your scalp and hair. Massage for one to two minutes and rinse thoroughly with cool water to help close the cuticles and seal in moisture. Step 3. Follow with your favorite conditioner but only on the ends. ACV will naturally condition your hair. **To find the formula that works best for you, experiment with dilution. Dry hair likes less ACV, while oily hair likes more, shorter hair needs less, while longer needs more. Do you have a favorite homemade beauty remedy for your hair using apple cider vinegar that you swear by? Or do you have an experience you’d like to share? One Response to How to Make a Clarifying Hair Rinse.